Our media rights agreement with the AIA does not allow us to archive this game for on-demand play back for longer then 72 hours, therefore we have removed access to this video. We have been told that it will be available to view at: https://www.nfhsnetwork.com/, but as of this update we can not find it on their site. We apologize for any inconvenience this may cause. This is the opening round of the 3A State Playoffs. The Falcons finished second in the 3A Metro East Region with only one region loss to ALA Gilbert North (10-15), and are 5-5 overall. The Lobos are the 2018 3A East Region Champions. They went undefeated in region play and have only suffered a single loss all season – to Ben Franklin (14-8) in the second week. 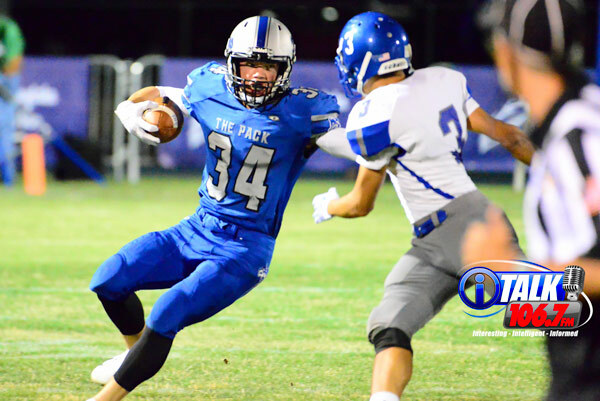 Snowflake and Fountain Hills have played two common opponents this Year: Payson and Pusch Ridge. The Lobos are 2-0 in those games while the Falcons are 1-1. They lost to Pusch Ridge 27-3. They also barely scraped by the Longhorns with a 13-6 victory, while the Lobos racked up a decisive win over Payson 34-7. The Lobos also have been averaging over 100 yards more per game in total offense than the Longhorns, and are averaging almost 2 touchdowns more per game. Some key Snowflake players to watch for will be #8 Ethan Ramage, who is averaging 170 passing yards per game, #25 David Brimhall, who leads the team in tackles (averaging 12.6 per game and leading the team in yards per carry at 7.1), and #28 Brigden Turley, who leads the team in rushing yards (averaging almost 73 per game). Some key players to watch for Fountain Hills include #55 Hafeez Momoh, who is averaging 10.4 tackles per game, #2 Ahmed Momoh who is 2nd in conference with 11 sacks this year (averaging 56.7 rushing yards per game), and the Falcons’ quarterback #12 Bruin Smith who is averaging 65.8 passing yards per game.